No matter if Washington DC is your dream location, or you have had enough of the high seas or desert; Metro DC Houses will be able to find you the perfect home in the DC, Maryland and Virginia Metro area. We are Certified Military Residential Specialists, having taken extra training to able to better serve your needs. 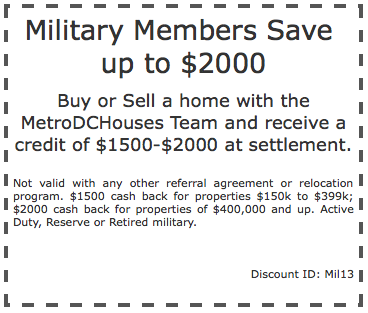 We have helped many military families find their perfect home – Let us help you. Send us an email to receive our free relocation package. Don’t know the DC area? No problem – We do. We work with a team of proven lenders, home inspectors and title companies that will make your home buying experience more fun that a GITMO port call. Moving your family; belongings and yourself are hassle enough – let’s try to eliminate the hassle and find you a great home in a great neighborhood, and a great price.